Edward William "Ed" Sampson passed peacefully at his home on Thursday, April 11, 2019 with his wife by his side. Edward was born July 17, 1939 in Sandersville, Mississippi to William and Rebecca Sampson. He later met the love of his life, Carol, and married at 16. Together, they had four children; Ricky, Allen, Cathy, and Paul. Edward started his career working at HK Porter later moving to Ingalls and Halter Marine. One of his greatest accomplishments was owning his own store, C & E Last Stop, with his wife. He retired as a gunsmith, which was one of his greatest joys. Many memories of Edward include taking cross-country hunting trips, weekends at the camp, and fishing with his buddies. Edward’s family and friends will always hold these memories close to heart. Many who knew Edward would describe him as loving, adventurous, playful, and kind-hearted. 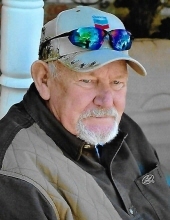 He enjoyed sharing his passions of hunting and fishing with family and friends. Edward was always found helping his children with yard work, building their homes, and tinkering around in the shop. He loved playing tricks on the kids and sharing laughs with those around him. Those who he left behind will miss his jolly laugh and big smile. His parents preceded him in death. He is survived by his wife, Carol Sampson; children, Ricky Sampson (Donna), Allen Sampson (Tammy), Cathy Sampson (Johnny), and Paul Sampson; grandchildren, Brad Johnson, Kenny Johnson (Sara), Wyatt Sampson (Natalie), Haley Cook-Kelley (Darryn), Cody Sampson (Allyson), Megan Sampson, and Luke Thompson; great-grandchildren, Averie Johnson, Morgan Johnson, Tristan Sampson, and Brynleigh Sampson; along with a host of other relatives and friends. The visitation will be held Wednesday, April 17, 2019 from 3:00 p.m. until 4:00 p.m. at Heritage Funeral Home in Moss Point, MS. The funeral service will follow in the funeral home chapel beginning at 4:00 p.m. with Bro. Gene Emswiler officiating. Interment will be held at Johnson Cemetery in Wade, MS with Wyatt Sampson, Cody Sampson, Brad Johnson, Kenny Johnson, Luke Thompson, Paul Sampson, and Darryn Cook-Kelley serving as pallbearers. To send flowers or a remembrance gift to the family of Edward William "Ed" Sampson, please visit our Tribute Store. "Email Address" would like to share the life celebration of Edward William "Ed" Sampson. Click on the "link" to go to share a favorite memory or leave a condolence message for the family.